Different problems call for different tools and solutions to fix them. In the same way that we wouldn't use a hammer to pound in a screw, we wouldn't use generic piping to waterproof a basement. At TerraFirma, we have the drainage solution you need to create dry, usable space in your basement or crawl space. We have specialized basement drainage systems that we customize for your unique problem - no matter what that problem may be. The TripleSafe sump pump is the best protection available for your basement. There are three built-in pumps to keep your basement dry no matter the circumstances. The 1/3 hp Zoeller sump pump is the primary pump and automatically turns on when water needs to be removed from the sump pump. The secondary pump is also a Zoeller sump pump. This 1/2 hp pump automatically turns on if the first pump fails or if it can't keep up with the water. This typically happens when there's a heavy storm or flooding. This secondary pump has a separate, heavy-duty discharge line so you don't have to worry about the line breaking under the pressure. The third pump is the UltraSump battery backup system. This system automatically turns on when the power fails and can pump up to 2,000 gallons an hour. The optional UltraSump battery back-up system can be added to the SuperSump as additional protection in case the power fails. 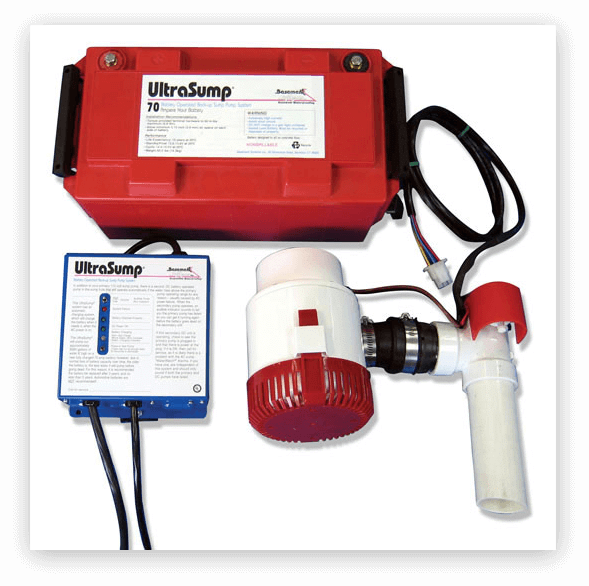 The UltraSump turns on automatically when the primary basement sump pump doesn't turn on, and can pump over 11,000 gallons on a fully charged battery. Once the power is restored, the UltraSump will automatically recharge so you don't have to worry about charging the sump pump. Zoeller Sump Pump: The Zoeller sump pump is the best in the industry. This cast iron basement sump pump is reliable and efficient. The TripleSafe sump pump comes with a 1/3 hp Zoeller sump pump to help protect your basement and keep it dry. 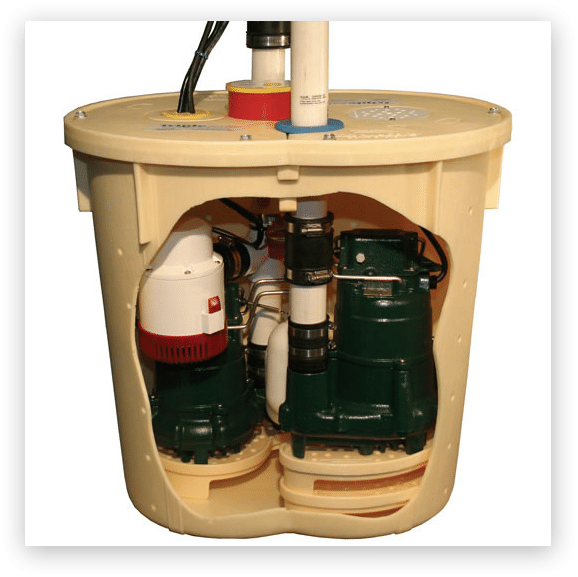 SuperLiner: The SuperLiner is a heavy-duty liner that protects your basement sump pump and allows ground water to enter the liner and be pumped out of your basement. The SuperLiner also prevents the switch from getting caught up in the sidewalls. WaterWatch Alarm System: The WaterWatch Alarm System alerts you when the water rises above the point where the sump pump should turn on. So you don't have to worry about going into your basement every day to check to see if your sump pump is still working, the WaterWatch will tell you. Airtight Lid: The patented air tight sump pump lid keeps moisture, bugs and radon gas from entering your basement, all while allowing plumbing leaks to drain into your sump pump. The lid is durable and child proof, which helps keep your family safe. Easy to use and low stress: All of these basement sump pumps are designed to keep your basement dry while making your life easier. The TripleSafe comes with WaterWatch so you don't have to worry about checking your sump pump to make sure it's working. Reliable: Each basement sump pump comes with an airtight floor drain that lets water in but not out. So you don't have to worry about your sump pump contributing to basement humidity. Trustworthy product: The TripleSafe comes with a Zoeller sump pump, the best pump available. And the UltraSump is a durable battery back up which is designed to perform in even the most challenging situations. Options: You decide which basement sump pump is best for you, and which features you'd like to add on for additional protection.